This time of year always has us scrambling for wardrobe updates. Looking great isn't an option when you have work parties and gatherings with friends and family. If you're looking to grab some feel-great/ look-great items for not-so-much than you might want to take a browse through TJ Maxx. Most of the above items are markdowns from earlier in the season but there are also good deals to be found on newer arrivals. A black and white color blocked Versace dress is $200 from a retail price of $450 and a Stella McCartney velvet tuxedo jacket is $500 from $829. While you're shopping, don't miss the jewelry counter. The brand is Italian-made Ottaviani, and there is a stunning cuff for $50 and Lanvin-like pearl and ribbon earrings for $15. 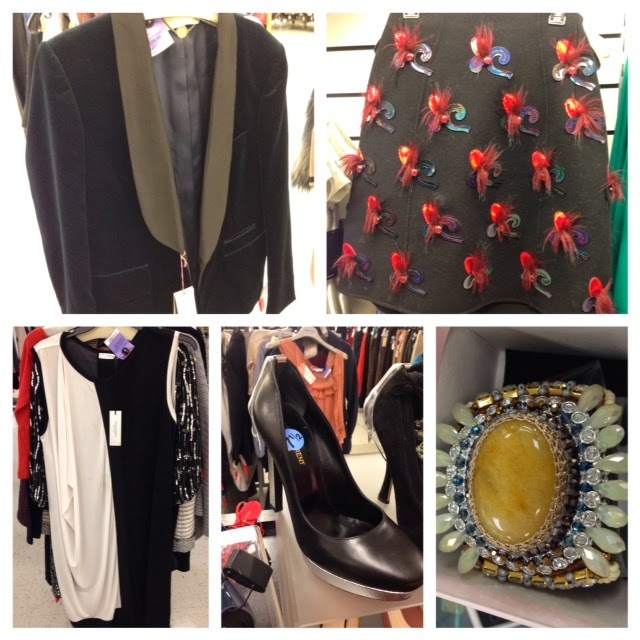 Heading uptown to the TJ Maxx on Columbus Circle, we found lots of different designer items but not so many markdowns. For example, an elaborate Marc Jacobs skirt with feathers and beading was marked $1000 from $2000, a chunky Love Moschino belted sweater is $249 from $625 and a See By Chloe dress is $150 from $375. Most impressive were new style Saint Laurent platform pumps for $500 from $995. Those looking to shop for kids gifts can also make out well at both TJ Maxx stores. Uptown we found a playful Betsey Johenson duffel bags that's perfect for sleepovers. It's price is $60 from $120. There is also a great selection of discounted Barbie dolls and accessories. Newly released, "Barbie Look" dolls are $17 from $25 and "Fashionista Barbie" is $13 from $17. Princess & Barbie Popstar houses are $30 from $40. We agree that it's a bit off color to buy gifts at a discount store but it's a great way to fulfill the "something for me too" urge. And really, we are happy to buy a Barbie anywhere it's discounted.